A destination of sincere hospitality and innate charm. Situated by the sea on a private dock in the Cape Town marina, the Cape Grace hotel is just in itself a charmed destination. The intimacy of the atmosphere and the sincere hospitality of the hosts will define your stay and guarantee you feel at home. It’s an attractive building with a classical style presenting an elegant interior design which respects the hotel’s identity and that captures the Cape essence. In all the spaces you feel and live the charm of the history and beauty of the region. In the generous rooms and spacious suites you’ll find a distinct design, quality materials, exclusive furniture and luxurious fabrics that create a special and unique ambience. All guestrooms offer views onto the busy port, lively marina or the impressive Mesa mountain. In the popular Bascule bar, savour a cappuccino and a wide variety of whiskies or wines from the Cape. At the sophisticated Signal restaurant, try flavours influenced by the various cultures that have passed through the region throughout history. At the African-inspired SPA, feed your soul with treatments aimed at rejuvenating the body. Cape Town is cosmopolitan and colourful with everything to enrich your stay, from the varied cultural and leisure experiences to its cuisine. 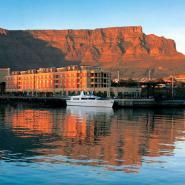 Choose Cape Grace as your haven in this vibrant city. Exit the airport by following the directions (EXIT), drive under the bridge and take the N2 highway. Continue until after passing the Golf Club and the river on your left and follow the directions for Stad / City N2 M3. The road will begin to turn right, stay in the central lane and follow directions to N2 / City / Foreshore / Seapoint. Continue in this direction and the port of Cape Town will become visible. Drive by the Holiday Inn Garden Hotel on your left and continue on road 7 following the directions for M6 Coen Steytler / Seapoint / Waterfront. Continue, with the port’s buildings on your right and stay on the right lane. Turn right at the traffic light and follow the direction for the Waterfront. At the following traffic lights cross the road and continue ahead along the V&A Waterfront. At the roundabout, take the second exit to West Quay and straight ahead the stands the Cape Grace hotel. “I went there just once but next time in Cape Town, Cape Grace is my Hotel." "Our stay at the Cape Grace was a once-in-lifetime experience." "Great Hotel, great Service, great Location, in one of the most beautiful cities in the world." "One of the best hotels we have ever stayed at! Attention to detail, friendly staff and a great location - we'll be back!!"